Sit in silence with me and the White Light of Purity and know that you have become beautiful holders of the most profound and unconditional love. Channeled by Genoveva Coyle. Greetings dear ones! I AM Serapis Bey, Chohan of the White Ray of Purity, your teacher, your family. Welcome dear hearts, into my Ascension Temple, the temple where ascended and ascending masters gather from all over the universe. I welcome you here, for you have arrived to spend some time with me and know that you are anchored in here permanently in your ascended selves. Nevertheless, you might still have to travel to different dimensions and places with different, even low vibration on Earth, or elsewhere in the universe, for your missions are quite complex and full! But, I want to encourage you to come to me often or, better said, I want you to focus your entire attention on those huge parts of your ascended selves at all times, but mostly when you feel that there is still work to be done clearing and purifying some parts of yourselves. And this also applies to those times when you have gathered some of your lost fragments that need integration into your dear selves. You have recovered and retrieved them, and now is the time for processing, healing, and incorporating and harmonizing them with the rest of your sweet selves. But this time doesn’t have to be a difficult and traumatic one; you do not have to isolate your dear selves and sit and feel these pains for too long, or too intensely, in order to remove and transmute them. I want you to come and sit in silence with me, with the White Light of Purity, to allow this process to be gentle and painless. There is no need to shed tears of sorrow. There is no need to feel and envision their, and your, worst nightmares. Instead, you can just develop that deep sense of compassion for yourselves, and for everyone finding themselves in similar predicaments. That time is over, for you have proven over and over that you have become beautiful holders of the most profound and unconditional love. And so, while you are working on expansion of yourselves – for there is always more of this deep diving, isn’t there? – I want you to remember that you have been accepted and have access at all times to my chambers of love, where the White Light of Purity is constantly burning brightly. Invite all the aspects and pieces of yourselves to attend, then sit with yourselves in silence. Polish and remove the shells or the tiny specks of untruths, see everything dissolving into the light, while at the same time the beauty and the purity of those little pieces of yourselves is revealed. This is the new way of removing some of the old suffering much more efficiently and cleanly than doing it while surrounded by chaos and the negative energies of others. Because, then there is a higher risk of acting out, projecting, and engaging in verbal, physical, and energetic drama. As the strong and wise masters-in-form that you are, you know where you need to retreat to, and how to do this delicate work of healing and restoring your dear selves. From here, that reconciliation and assimilation of every part of thee will be natural and smooth, with every part of you taking back their rightful places in your loving hearts. I will leave you now with an overflow of purity, and my eternal love! Farewell! The ascended masters help us become aware of the Paths back to the Source. Paths that we can walk over to master the seven rays of our Christ consciousness that emerge from the white light. The seven color rays are the natural division of the pure white light emanating from the heart of God as it descends through the prism of manifestation. These are the subdivisions of the wholeness of Christ. Regardless of their color, all of the flames have a white-fire core of purity, which embodies all of the attributes of God and which may be invoked by those who desire to expand the Christ consciousness. The seven rays present seven paths to individual or personal Christhood. Seven masters have mastered identity by walking these paths, defined as the seven archetypes of Christhood. These particular ascended masters are called the chohans of the rays, which means lords of the rays. Chohan is a Sanskrit term for lord, and lord is equivalent to law; hence the chohan is the action of the law of the ray. To be a chohan on one of the seven rays means that this master defines the law on that ray; through him that energy of the Christ and of God flows to mankind, to all who are evolving on that particular path. The fourth ray is the ascension flame, the white light of the Mother in the base-of-the-spine chakra. Out of this white light comes architecture, the principles of mathematics, the foundations of the building of the Matter temple and the pyramid of Self. In the presence of Serapis, one knows an entirely different conception of what we call the Christ, the real person of us all. Known as the Great Disciplinarian, Serapis came from Venus with the Ancient of Days to rekindle the sacred fire in the hearts of a wayward mankind. His great enthusiasm to reclaim the sons of man as kings and priests unto God swelled and mounted into a flame of iron will, determination and discipline. He assists his students in the self disciplines that are necessary for the ascension: the discipline of the four lower bodies in order that the Christ may appear and use them as vehicles for service and attainment in the world of form; the disciplining of past momentums of negative spirals and of human creation that would stand in the way of the ascension flame forming within the heart of everyone evolving upon the planet through the acceleration of the threefold flame. Guiseppe Verdi captured the music of the ascension flame in the Triumphal March from Aïda. The radiance of the electronic presence of Serapis Bey and his twin flame pour through the aria Celeste Aïda. The keynote of the Ascension Temple is Liebestraum by Franz Liszt. Architects, planners and those dedicated to the purity and discipline of any undertaking serve with Serapis Bey on the fourth ray. Serapis was a high priest in the ascension temple on Atlantis. In Egypt, Serapis was the architect of the Great Pyramid. He was embodied as the Egyptian Pharaoh Amenhotep III, the son of Thutmose IV and the great grandson of Thutmose III, an incarnation of Kuthumi. He also embodied as the Spartan king Leonidas. Serapis was the sculptor Phidias during the fifth century BC in Athens and regarded as the greatest of all the Greek sculptors. He was the architect of the Parthenon, supervising its exquisitely masterful construction. Within the Parthenon he placed his most famous work, the forty-foot high statue in gold and ivory of Pallas Athena, the representation of the Mother figure, the Goddess of Truth. His art is characterized by its exalted beauty and spirituality, and he lived as the ultimate personification of the golden age of Grecian master artists who had an enduring influence on all subsequent Western art. The book Dossier on the Ascension by Serapis Bey is a textbook on the path of the ascension. It contains teachings from the classes he conducts at the Ascension Temple, and through it, you can have anchored in your conscious mind those lessons that you learn at the Ascension Temple at Luxor while your body sleeps at night. He outlines the requirements of the ascension and provides a thorough explanation and instruction on the process of the ascension. Use the Science of the Spoken Word to connect with the Ascension Flame of Serapis Bey. Blaze Ascension’s Flame through us! “Hail Serapis Bey, Lord of Ascension’s Flame. Marching to the sound of victory, of trumpets sounding the sound of your natal day, of the soul’s rebirth—being born anew first in Mater and then in the glorious array of the ascension flame—you are born into Spirit for eternity.”—Djwal Kul, from the meditation, The Hidden Chamber of the Heart. Here we have another reference to the transformation and transmutation of the energies of the 8:8 Lion’s Gateway. What is darkness must be brought into the Light. And the Light is here, Now! This is a message of such profound change that it resembles resurrection ~ the phoenix rising up from the ashes. New life. Death of the old and Rebirth. Complete transformation and radical shifting change. We are awakening to ascend. We are realizing why we are here. Remembering our Soul Path, and why we came here lifetime after lifetime. We are almost able to complete our mission and start again in the creation of the New Earth. What else is possible here? What have you learned so far on this journey, in this particular incarnation? How can you apply your previous life lessons and experience to the rest of your life now? Where can you release these lessons and avoid repeating patterns? Where is change necessary in order to grow; where have you been holding on for too long and what areas of your life are calling you to expand and flourish? You are creating the rest of your life, right here and now. Look closely at where you are putting your energy, your focus and your intention. Take responsibility. Be the driving force in your own life. Normally it is each of you, my brethren, that seek me out for the purposes of letting go, eliminating, bringing forth the truth, the purity, the beauty of who you are in this process of going forward in your ascension process. Now, what is my role in this? Steve: Our guest today is Serapis Bey and I think, Linda, you have the meditation that he gave you on your web site? Linda: That is correct. And in fact, I had sort of forgotten about it and he nudged me this morning as I was getting ready. There is a meditation that he gave during a workshop that I did a couple years ago. And it is an ascension meditation, taking place at the Ascension Chamber in Luxor. And it’s actually a beautiful, beautiful meditation. I went back and listened to it and it’s very powerful. You know I haven’t heard from Serapis Bey that often, but when he shows up, it’s always monumental. You know, he’s a no-nonsense kind of being. He doesn’t mince words, and when he has something to say, it comes forth strong and powerful. So, yes, he has suggested to me that after listening to what he has to share with us today, he would really like people to be listening to this meditation. Steve: Well, very good. While you’re making your transition, let me say a few words about Serapis Bey, because we haven’t had him on the show before and some people may not be aware of him. He is the Master of the Fourth, or Ascension Ray – the Ascension Ray of the Mother – the Hierarch of the Luxor Temple. In one of his past lives, he was reputed to have been the Spartan King Leonidas who stopped the Persians at the Pass of Thermopylae, where he died. Leonidas has come to symbolize personal responsibility and self-discipline. We know him best as one of the three Ascended Masters, the other two being El Morya and Saint Germaine, who began many centuries ago what later became known as The Saint Germaine Trust. He’s here today to extend the discussion we had last time with Archangel Michael about ascension. So, with that, I welcome Serapis Bey. Serapis Bey: And I welcome you. Yes, I am Serapis Bey, known by many names, as have each of you my beloved friends. Yes, known as the great disciplinarian, as Master of the Fourth Ray. This is the Ray of Ascension. This is the Ray of Purity. This is the Ray of the White Crystalline essence and energy of the Mother that we have told this channel a long time ago is called Luminesa. I welcome you. Normally, and it has been this way for an exceedingly long time, it is each of you, my brethren, that seek me out for the purposes of letting go, eliminating, bringing forth the truth, the purity, the beauty of who you are. And this has been the way in which I have worked with many of you in this process of going forward in your ascension process. In your acceptance of the beauty and uniqueness, the wonder, magnificence of who you are; while eliminating through perseverance, through consistency, through self-discipline, through self-responsibility any sense of your ego, of your own uniqueness, of that sense that you are special in the human ego way of the old realm. You are unique and special because you are an expression of the Mother, the Father, the One. And that expression is strictly and uniquely so that you can manifest the wonder and light of that purity and beauty: to go from a sense of singularity, to be transfigured into resurrection, to return to the Mother, Father, One. Traditionally, and I am certainly one for tradition…traditionally this has been an arduous journey. For although I assist you in this rebalancing, it would be erroneous for me to pretend that it has not entailed a true devotion and a singularity of focus to go through this ascension process. Now you, each of you – and in this I speak to the entire collective, to all who currently sit upon Gaia – have made a very unusual decision. Yes, in December of 2012. And you made this decision and in that moment did release your sense of ego and individuality enough that you said collectively, as a unity consciousness, that we will go forth in our ascension one by one. No, as One. I am ancient. You might say I have been at this for a long time in your reality or any reality. Never had I experienced, witnessed, or envisioned a decision of such magnitude and gratitude, a recognition of the connectedness between all of you. I have never seen or anticipated this. Now, of course, the Mother, in Her wisdom, always knows the unfoldment of Her Plan. But, it has certainly shifted how I work in my service to Her. Now, in that, in the intervening years, I have stood back and I have still continued to work with many of you, one by one by one. Occasionally, you have come with your sacred partner. But, even in sacred union and partnership, the diligence, the balance, the stepping forward is and has been individual. But I have also worked with the collective quietly, which is my want. Humans have used far too many words and ignored the strength of spirit. But although there have been many words in these intervening years; particularly you the light workers, love holders, have gained in strength and a sense of discipline. And you have gone forward and I have worked with you silently and sometimes not so silently. You see, endurance and fortitude and prudence are required – yes, required – for ascension. And you say to me, “But, Serapis, I like to be in the flow.” Well, there is no room for laziness, spiritual or physical. So when you say that you wish to be in the flow, there is still a requirement for attention to your being, your responsibilities, and for steering the vessel, as it were. You cannot abandon that. And I extol your virtues, because you have not. You have paid attention. You have relinquished a great deal of ego because there is no room for self-aggrandizement. The only thing that we adore is the unified Mother, the Father, the One. Now, why do I speak of this? As Michael, Mi-ka-el, has spoken to you, as the Mother herself deigns to speak to you, there is a new energy that penetrates your entire planet and this collective of One. So it is not individual, and yet, of course it is. But it is equally shared to all. And the Mother, in Her infinite and eternal wisdom, has asked all of us to share, to expand, to extend, to unify, and to penetrate the entire planet with our unique expression of Her love. This is a gift beyond measure. I do not think that many of you fully comprehend what this means. You could no more resist this flow of energy…like a Tsunami of One. In fact, that is a good name, is it not? You cannot resist it. So your method of not merely survival, but of taking true measure, advantage of this energy that we all send you, is to conjoin with it. Yes, in prudence and balance, fortitude and endurance, acceptance, allowance, thanksgiving, gratitude, and purity. Now, what is my role in this? And believe you me, I have asked the Mother this many times throughout many, many, many, many, many, many centuries. I assist with ascension and there have always been committed adepts who have come to me. But in this shift – because that is what you are in the middle of – my role also changes. You, my beloved students and disciples, for those who are brave enough to even approach, have always come to me in and out of form. It matters not. But, at the beckoning of the Mother, I come to you. So you see, this shift, this ascension, this process that you are undertaking, shifts things not only for humanity, but for many of us as well. Now we are fully capable and willing and happy, joyous, to do this. But it is certainly a change of venue. There is nothing that I would not be honored to do for our divine Mother. And, because each of you are of the Mother, of Her pattern, there is nothing I will not do for you. I come to you as brother, as one who has walked the planet many times. And yes, I am the disciplinarian, but only insofar as it brings you to the place of purity and power and the acceptance of responsibility for your sacred self, because that is your promise to the Mother. So now I come to you in sacred union and partnership to offer you my assistance. All of humanity – I come to you to assist you in the deeper letting go, in the deeper elimination of all aspects of your being that are not a crystalline, clear alignment with your divinity and the Mother’s divinity. I will guide you, I will support you, I will walk with you, I will correct you, because it is not of punishment. That concept, and certainly that behavior does not exist on our side. But if you are headed consistently, or even now and then in the wrong direction, if you are praying and praying and working, and at times even struggling to come into that alignment that you can simply walk right through the portal and you think you are doing your best, but you are erring in one way or another, I will correct you because I love you, because I honor you. Not because I wish to point out that you are in the wrong. That is futile. I would correct you, and I will correct you if you ask me to, so that you do not waste your energy and your heart energy in pursuing something that is not going to get you where you want to be. There is every gradation of heart consciousness right now upon your planet, and many doors that you have been waiting for, for a long time, have been flung wide open. Now we are adjusting and helping you adjust to these new ways of being. Now, for those who are completely oblivious, there is a more subtle penetration. But I am also speaking not only to Gaians but to those of you that are awake. You’re saying, “Well, what can I count on you for?” You can count on me to be fully and completely consistent. You can count on me to point out and correct when you misstep. But not only to say, “Oh no, you are doing it wrong,” but to gently, and sometimes not so gently, redirect your energy. Why I do this is to bring forth purity and beauty, love. You’ve come to this planet as the implementers of the Mother’s Plan. Now we are part of that implementation team, but in a very different way, because this ascension is in physicality. This ascension is remaining on Earth and creating and anchoring Nova Earth – a beautiful paradigm that I would and in many ways did manifest when I was in form. So I know the diligence, the attention, the hard work that this has entailed. So yes, I come to tell you that I am bi-locating mightily. I am still in the chamber at Luxor. But I am also in every town, city, metropolis, countryside of your planet, working with everybody. I do this for the Mother, but I also do it for you. Those of you who choose to work with me, who take my extended hand, have a deep level of commitment, valor, bravery. So why do you do this? Because it speeds things up: that your yearning, your determination to ascend and to lead the many is so strong, your commitment is so deep, your eagerness is beyond what humans think of. That is why you do this. And with that, that is why I accept you. It requires balance, self-responsibility, and discipline. You cannot say I will do it one day and then slack off for the rest of the year. I do not work like that. Ascension does not work like that. Now, dearest friend Steve, where do you wish to begin? Steve: Serapis, your discussion has been most unusual among people that we’ve had on the show. Up ‘til now it’s emphasized what I may be permitted to use “the divine feminine,” which is to let go, to flow, to drop resistance, to surrender. And yours is very much the voice of the divine masculine – use of will, the exertion, effort, discipline. So it’s a very different perspective you’re giving us. Let me ask this question. Either in ascension or in the stewardship of the Mother’s abundance, in either field, your words apply. That we need to show discipline, we need to be consistent in our practice, et cetera. Can you talk to us more about this whole faculty of will? About where light workers are with their exertion of will? And any changes we need to make into the future as we either go into ascension or into stewardship? Serapis Bey: I would be pleased to talk to that. And yes, my tone, my energy, is significantly different from many who have come forth. Let me begin with an observation, which is grounded in truth. I bring to your attention the value, the importance of the divine masculine and the masculine. As you ascend there should be, and yes I say “should” – should be no differentiation between those two. I am a servant, so deeply honored to serve the Mother. But what do you think the divine masculine does? Now, very often, in these discussions, which are correct by the way, there is discussion of the divine Godhead, shall we say, of being the unspeakable, unknowable, unmovable. But the masculine serves the feminine, feeds the feminine, infuses the feminine, so that that movement, that eternal infinite creation takes place. Now, the divine feminine in that creation, in that movement, in that speech, serves the divine masculine. It is the balance. It is the reciprocal nature of all. Too often, in the history of humanity, which is long and bloody, the sense of the masculine traits have become bastardized, have become abused. And that is part of the self discipline to never fall…never fall…into the patterns of authoritarian control, or greed or lust – abuse of power. And that is part of what you learn at my temple. You are entering a phase of time where it is the fullness of our Mother’s energy re-anchoring upon this planet, and actually much farther than that…but we will focus on this Gaia. But what has also happened in this spiritual awakening of many, and now I speak particularly of light workers and love holders, is there has been a somewhat shying away. And I am speaking in generalities, so do not feel, unless it is totally applicable to you, that I am in any way chastising you, because I am not; I am explaining. Many of you have backed up from what you have thought of as those masculine traits, and moved into what I have suggested – the flow, the surrender, the acceptance. All of these are completely necessary for stewardship and for ascension. But so is the balance with the divine masculine. How action from your heart consciousness, from the love, comes into form is through will. How you demonstrate the power, in the purest sense, to be a steward, to assume that responsibility, is through that sense of self-responsibility. If you do not have self-discipline, self-responsibility – not in the sense of self-aggrandizement, but of commitment and knowing the truth of your place in this grand unfoldment – then you cannot be a responsible steward. So that balance of both is absolutely necessary. Action, with the new responsibilities coming to you, is necessary. Now, what has happened with humanity, male and female, is that when I speak of action and bringing into form the building, whether it is the temple at Luxor or a home for yourself, it requires action. Now, there has been a belief system that has come into form that action or attendance…because I will not use the word ‘work’…is somehow arduous or that it has to take a long time. And none of that is of truth. But, it is the willingness and the will to be in alignment with truth, of Michael, of the Mother, of the beauty. Why would you create anything – whether it is a meal, or a cup of tea, or a city, or an institution, or a tradition – that is not of purity and beauty? But that requires the self-discipline to make sure that the self-aggrandizement isn’t creeping in. Now I am not saying that there is only one vision of beauty or purity. There are many reflections and expressions of it and that is the unique beauty of each of you. But, when you are taking these actions in what you think is a balanced way, the beauty is a reflection of that part of your divinity and the Mother’s. It is the willingness to service. That is what stewardship is. And unless that is present, the blessings do not flow. These blessings that you have talked about are given in a responsible way. That was our agreement when we have formed this, and many by the way, several trusts, that they would be divinely patterned, divinely inspired and a reflection of divinity in form. So, there is no room for what people have thought of as the old masculine, of the ego. There is work to be done. And that is why I have said to you, if you are going slightly askew, then I will correct you. And it will be gentle, and then it will be stronger, because it is important in our partnership that we listen to each other. I do not speak or whisper simply to hear my voice. I have no need of that, for it is far more wonderful to simply listen to the Mother. But when the Mother has asked me to step forward in this way, and teach and model and mentor the self-responsibility and the balance, I do so. So is my voice one that you are not used to hearing? Yes. But, is it part of the balance that already exists and exists in you and of you? And so both sides, not either/or, but the cooperative partnership of your divine masculine and your divine feminine. But, what moves, what moves you, what speaks through you, what anchors on the planet is the divine feminine, infused and held by the will and the spirit of the divine masculine. Both are necessary. Do you understand what I say? Steve: Yes, I do. Oftentimes, I don’t follow up on something a person in your position says, Serapis, and I kick myself afterwards. And I don’t want to do that here. Please, could you talk to us about the work that remains to be done? And I’m talking specifically of light workers, of ascension way showers, financial way showers. Serapis Bey: Examine your motives. Now, this is something, whether I come to you or you come to me, it will always be our starting point. Are your motives – and I do not adopt an accusatory tone, this is simply the way I speak – are your motives, is your motivation of purity? You have seen upon your planet how money and power have corrupted. How it can easily, very easily, lead to egoic thoughts, feelings, and expressions. And that is the road to hell. (Chuckle) Not that hell exists. The motive of being a steward, whether it is a pathfinder to ascension, a pathfinder to new institutional ways, pathfinder of new communities, a pathfinder of new financial wherewithal, the motivation is actually quite clear. It is this humble, exalted, desire to serve the Mother. And in that expression of service is to serve your fellow humans as well as Gaia and all the kingdoms. If it is – and I am not suggesting, by the way, that this means that your own personal wherewithal is not attended to, because if you are not taking care of yourself, this is self-responsibility – if you are not taking care of yourself, if you are not taking care of your family, and in this I mean not only your biological family, those you have chosen to incarnate with, but also your soul family, your soul community. If you are not taking care of that, then you are not being responsible and self-disciplined. But, what is your motivation? Is it based on an ego desire to be important, to be boss, to have power of the worst kind over others? Or is it in your own discerning, humble way to truly serve? So the first thing that is worked on is the mental, emotional, ego needs, because there is no room for this. Think of it this way. In a hierarchy, which is often how humans have thought, you want to put yourself at the very bottom of that hierarchy because that is what service is. Now, in your traditional thinking – thinking that I have to be at the top because I have to lead – leadership is patterning the right behaviors that are true to the Mother, the right actions that are true to the Mother, Father, One. So we start with this sense of “Oh, I’m going to have money. Oh, I am going to have power. Oh, I am leading the way.” Now if it’s because it makes you feel important or does it make you feel truly important because you are fulfilling your promise, your responsibility to your sacred self and to the Mother. Because there is a fine line, and this how humanity has gotten off track – that you want to be in charge, or you want to be more important than your neighbor down the street. No being, not on our side or yours, not throughout any multi-verse, is more important than another. That includes me, El Morya, Jesus Sananda, Maitreya, none of us. You cannot assume this. There is no room for ego. And this is something that you must, MUST, be vigilant of and that you must give each other permission to observe and if it is in need of course correction, to speak of in saedor, in kindness, in balance, in love. But if you see truly, not from a place of anger or mistrust, but if you see one of your dear family going off track, then of course, out of love you point it out to them. Then the choice is theirs. You’re handing them over to me. But this is work. Now, the second thing that you work on is consistency. I hear many of you say to me – you don’t know you’re speaking to me. Sometimes you just think you are speaking to each other. You say, “Oh, I can’t meditate.” And then you just don’t bother trying. Well, that’s the same as saying, “Well, I can’t run the 10K and therefore I am going to stop walking.” It is absurd. This is self-discipline. And meditation takes many forms, and I am using that as an example because it is a popular one. So, my question to you is, do you consistently give yourself a path, not a sense of path, not a sense of path as in “I do not wish to harm myself, I love myself because I am love and I am the love of the Mother. And the Mother loves through me.” But if you are in genuine relationship, think of your partner, your spouse, your best friend and you say, “I am in this deep, abiding friendship. Oh, and by the way, I can’t call you. I can’t talk to you. No, I don’t have time to see you, but I love you.” Well, is this real? Of course not. You are lying to yourself. So where is your consistency? Where is your self-discipline? There is a belief… you have come to think of discipline as punishing, controlling, some form of pain, or that you have done something wrong. That is not discipline. That is cruelty. Think of discipline and self-discipline as consistency. Are you consistent in what you think and feel? Where you place your attention and your actions? Or are you all over the map, as you would put it? And, if you are, the disciplinary action is not, my beloved friends, to beat yourself up. It is to gently take my hand again and bring yourself to the center, to stillpoint if you can, and simply refocus. So this is another area of work. And, in that, look at your actions. “Do my actions and behaviors and interactions match the truth of what I am really hoping to achieve, that fulfillment with the Mother?” Your biggest area, can I say, where you can improve somewhat, is in the treatment, thoughts, feelings, actions, anchoring that you have of yourself. Now there is still some more mayhem on your planet. But if you bring the attention back to yourself, “Am I being pure? Am I purity? Am I beauty? Am I love? Am I luminescent joy?” You’re very hard on yourselves. And, think of this. Yes, in your lifetime there have been many, many challenges…I do not deny or minimize at all. But in the treatment, the feelings, the knowing of yourself; you see, all those control and hurting disciplines, they come from ego, who is very eager to maintain control. But, the Mother, our beloved Mother, is nothing but gentleness. The reason we do not tend to speak of the qualities of the Mother in terms of will, for example, is that it is not necessary. When She dreams, or creates, there’s such gentle love that you do not feel the necessity for will-directed action. So when you are looking at yourself, is the balance there of the gentlest love that simply puts the will into place and allows it to flow smoothly, gracefully, beautifully? Discipline and self-love is not about cutting off your arm to show that you intend to serve. It is about loving your arm and loving yourself. There is work to be done there. Steve: Serapis, I have squeezed every minute out of the hour to give to you. Is there anything you want to say in closing, since we have reached the top of the hour? Serapis Bey: I have declared myself as a being that is traveling your planet. If you whisper my name, if you approach me in Luxor, I am at your disposal. It is my dearest desire that you will call me. Farewell. I’m greatly impacted by Serapis Bey’s interview on An Hour with an Angel this week. Not like I was aware of it until he spoke, but every soul that we’ve had on the program up till now has put forward the point of view usually associated with the divine feminine – let go, don’t resist, surrender, flow. 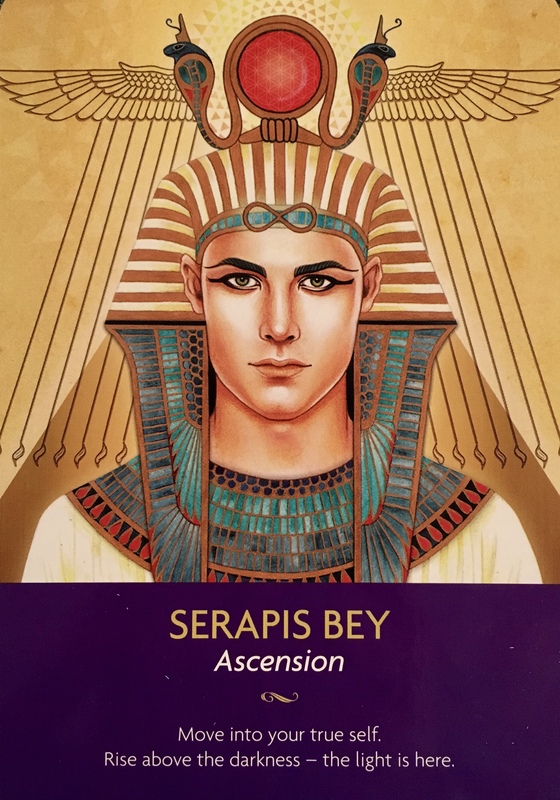 Serapis Bey uniquely put forward the viewpoint I’d associate with the divine masculine – persevere, be disciplined, have a determined will, push through to the end. One of his past lives was as Leonidas, King of Sparta, who, with 300 others, stood off the Persian army at the Pass of Thermopylae. Leonidas is known for his iron will. He couples that with purity of intention. His intention is to serve the Divine Mother. His will is not directed against anybody, except perhaps himself. It’s directed to achieving the Will of the Mother. It’s my surmise that a will truly bent to the service of the Mother would have lost the ability to harm. He said that there was no room in lightwork for self-aggrandizement. He pointed out that everything the Ascension aspirant does is in service to the Divine Mother, not the ego. If someone was still into those vibrations, they’d be unable to serve, he said. And the Company of Heaven would probably not use them. He spoke very candidly. He said that the divine masculine was meant to serve the divine feminine – and vice versa. The genders were meant to cooperate. This cooperation is what is missing and what the rebalancing that is being done now is designed to restore. What I took away from the discussion was that the gifts of the divine masculine were to be made freely available to the divine feminine, and vice versa. There was to be some specialization of function (child-birthing, child-rearing, for instance), offset by the free service of one to the other – in marriages, communities, and so on. The way he knit the vision together inspired thoughts in me of King Arthur’s Camelot, the finest of chivalry, Biblical communities, intentional communities. There has always been something about these chivalric stories that appealed to me. As a young child, I was reading tales of chivalric knights – Ivanhoe, Roland, the knights of the Roundtable. One thing I think they got right was that the chivalric knight served the woman. If the woman served the knight too, the balance would have been captured. But men chose to subjugate the woman. We had one gender’s service being demanded of it (the feminine) and the other not extending service in return (the masculine). Everything is out of step with universal law and creates nothing but residue of resentment. Patriarchy rested on a foundation of subservience, which could never stand. In my view, it saw the complete breakdown of the way the genders were divinely meant to relate. Our relationships were filled with drama, which became the stuff of our nightly entertainment. We hated the drama in our lives but laughed at the drama portrayed on TV. We were stuck in a cycle of drama. No love can be found there. To borrow Archangel Michael’s expression, this way of being is being “re-gridded” to rebalance it, to re-establish the mutual connection of the genders through love and service to each other. All of us have a chance to lead in this brand-new expansion in the meaning of humanness, happening around us. A second memory was aroused in me by Serapis’ words: Perhaps a peculiarly male side of life – the love of discipline. His discussion of discipline as consistency took me right back to the karate dojo. You had to be self-disciplined if you were throwing kicks and punches around. I so loved what I could do with my body in karate. And the essence of karate was discipline. He re-awakened a sense of the divine masculine in me (both genders have it), which I’d been resisting and suppressing for a very long time. He gave me permission to reconnect with it, under altered conditions. There’d be no more parasitic feeding of the male upon the female. The gender bond has to be one of mutual loving service, and that in itself leading to service of the Divine Mother. Transformative love would make the difference between swimming against the Third-Dimensional tide and sailing on smooth waters. Without both genders serving the other, the train goes off the rails. For men especially, this’ll be an adjustment, a rediscovery of ethics, honor, and self-control. For women, I imagine it’ll primarily be a test of forgiveness and then of wanting patriarchy to stop. Many of you are accustomed to radiating and focusing upon projecting your soul light into your entire body, aura and surrounding area. This is a basic practice which not only increases your spiritual awareness and evolution; it creates a momentum of receiving fulfilment from within and to be experienced outside of you. To radiate your soul light is to connect deep within your being with the essence and core of your energy. This energy is beyond your physical body and even auric field, it is an energy which is with you and expresses you whether you are on the Earth or the inner planes. Your soul is a part of the greater whole of the Creator; therefore it is composed of such rich and fulfilling wisdom, light, love and consciousness. In truth everything is available to you through radiating and expressing your soul. It is my wish that you come to realise, not only within your mind, within your belief systems and outlook upon yourself and reality, that everything is available to you through the expression of your soul. With this knowledge trusted and embedded within all aspects of your being you can begin to truly work in harmony with your soul as if you are connecting into its advanced capabilities. When you radiate your soul do you truly know what you are emanating and bringing into your physical reality? This is a wonderful question to contemplate, you may have many answers or you may be unsure of the energies, qualities and wisdom being emanated and how this influences your experiences on the Earth. In my communication with you today I wish to support you in finding your way in co-creating as well as understanding your soul’s expression and purpose within your reality. When you emanate and imagine your soul light flowing in all directions from your heart chakra or in truth any other chakra, you are emanating a vibration of your soul which is drawn forth to support and assist you in that moment. All qualities, light and consciousness are perfect for each present moment, so in truth there is no need to achieve any more as everything appropriate is shared, anchored and deli vered into your being and reality. This is a powerful knowingness which supports your greater co-creation and experience of your soul, however there are qualities and aspects of your soul you can connect with creating a focused energy download into your being which supports you in creating with your soul experiences, energies and circumstances which propel you forth in spiritual evolution, happiness and fulfilment. I will explain this further. First I wish for you to connect into your soul, take the attention of your third eye into your heart chakra allowing the light of your soul to emanate in all directions abundantly. Then invite and ask your soul’s energy to merge with your mind/ thoughts, emotions/feelings and the divine plan for your soul in your current lifetime. Simply know and allow this to take place observing any shifts or alterations occurring. You are now more fully connected to the Divine Creator as you invite yourself to contemplate or be inspired as to important events, experiences, people or even material objects that require to be manifested within your reality, accepted and experienced to aid your spiritual evolution, happiness and fulfilment on all levels of your being. In many ways you are asking what do you as your soul wish to experience and achieve in your current embodiment. This is a very special moment, even if you do not understand, connect with or gain any inspiration, simply allow this part of the practice to be achieved often until the inspiration dawns, it may be the same as your current passions and desires in your physical reality. Ideally you may be able to write down numerous inspired ideas which through their manifestation will support your spiritual evolution, happiness and fulfilment in your realit y. When you radiate your soul light you will naturally be emanating qualities, energies and consciousness which move you into alignment or aid creation of experiences which support you in numerous ways, however you can co-create with your soul to allow your soul to create a greater impact within your being and reality. In many ways this process is about letting go of boundaries that you may have created yourself for yourself to hinder and limit your soul. If there are areas of unhappiness or lack within your reality then this signifies you are limiting your soul’s presence in these areas. This is usually because of a belief you have created which acts as a boundary and interference to your soul. With your inspired ideas which are born from your soul you will allow yourself in more ways than you could possible imagine to move through boundaries, limitations and fears to be more conn ected to your soul and all that is the Creator, thus you create fulfilment through offering freedom to your soul within your physical reality. The next part of the practice is to imagine your inspired ideas, dreams and aspirations as you focus upon yourself existing surrounded by your soul. Feel as if you are in a cocoon of your soul light, safe and supported, while you allow yourself to visualise or imagine your inspired ideas, especially imagining the feelings you may experience. Achieve this for a few minutes until you feel a connection with the energy, presence and manifestation they hold. I now invite you to ask your soul to bring forth from its abundant energy the qualities, energy vibrations or consciousness which is required to create and manifest your soul’s aspirations. You may become aware of only one quality of energy such as peace, love, enthusiasm, activation, healing and so forth or you may become aware of many. It is important to keep it simple and so we ask collectively and on your behalf that you are made aware of no more than eight qualities. You may wish to write them down, these will become constant and empowered downloads into your being to aid your experience of that which you/soul desires. The energies will synthesis to create a very beautiful and abundant energy which is empowering, satisfying and supportive when you connect with it. Take some time asking to connect with the synthesised energy which is a combination of the qualities of your soul you have been made aware of. Invite your soul to download the synthesised energy into your being as you breathe deeply. Feel it circulating your entire being, enjoy and become accustomed to the sensation, so you can recognise when it is pouring into your being from your soul. Know that this energy flowing from your soul will support your spiritual evolution, happiness and fulfilment in your current reality. Know that each time you express your soul light you will also be embodying this concentrated energy of your soul. Take time in your daily reality to focus upon the synthesised energy merging with your being and reality. This is a beautiful experience as you are not only connecting with the abundant and expansive energies of your soul you are inviting your soul to create a concentrated energy as well which is supporting your divine plan upon the Earth and further connection with your soul. You may discover that as your inspired ideas and aspirations manifest you will need to move through the entire process once more to create from your soul new aspirations and concentrated energies, thus embodying your soul free from limitations and boundaries, offering your soul freedom within your being and reality. The process I have communicated to you is to support you in co-creating further with your soul thus knowing, sensing and experiencing your soul more fully. It is a process which will allow much progression. SM: Serapis Bey is with us today to share wisdom around the practice of spiritual discipline and the consistency required to attain higher consciousness. This is one of several Masters that I don’t know much about so it will be interesting to feel the energy with this one and see what he has to say. Good Morning, Linda! Linda: Good Morning, Suzi and Good Morning, everybody! It’s a bright, shiny day again here in Florida and as you and I were talking about just briefly before we got on the air, we are in that season of rebirth and what some people are calling resurrection and redirection. There is so much energetically going on right now – right here, right now – that it’s almost like a whirlwind to keep up with things. SM: Yes, and I think it can feel different ways to different people. I am feeling inspired to new ideas and doing a new show and everything, but it can also feel very overwhelming. And if we’re not feeling so great and wondering like, “Oh God, all this great energy is coming in and I still feel like crap.” It’s an interesting thing. The vision that they are giving me in terms of the energy is that the Tsunami isn’t simply coming up to the shoreline; it’s literally this wave of Love that’s coming at us from the Mother, from our star brothers and sisters and being delivered by the ayoscended ones, etcetera. It’s carrying us all the way up, and the picture that they give me is that we’re literally standing on the top of Mount Everest. That’s how strong it is. And although it’s not intended for any of us to remain in isolation on the top of Mount Everest, there is an energy that is that strong. And the Mother has been really clear. She says, “First I gave you the Tsunami of Love; I’ve given you the Clarity, I’ve given you the Purity, I’ve given you the Grace. It’s not that she’s planted the seed within us which she did eons ago, but that the seed within us has germinated, that she has germinated that seed and that this energy within our heart which is only the Love energy is growing, growing, growing, growing. Linda: No ego. And that’s pretty much what Serapis Bey is the Master of. Yes, he’s the spiritual disciplinarian, but he also works with people preparing for Ascension in the etheric Temple of Luxor and the Ascension Room. And it’s the death of the ego that he oversees. He is quite a character. And for those of you who don’t know Serapis Bey, he is one of those when you’ve seen the pictures of St. Germaine and Lao Tzu, or I should say Djwhal Khul, and El Morya, the founders of the Theosophical Society. He worked very closely with them. So he’s had several lifetimes on planet but he ascended – apparently, because who knows how these things really work – but he became an Ascended Master long before the time of Christ, about 400 BC. So during the time of Atlantis, when Atlantis was sinking, he migrated and took the Ascension Flame from the Ascension Temple in Atlantis and moved it to Luxor where it is this obviously etheric temple where he works with the alpha and the omega flames to help people become that Purity. Linda: Be consistent, period! [Laughter] You know, I am saying that to Isaac the other day. I felt like there is part of me… and I’m sure that everyone who is listening, including you, Suzi, has this feeling like, “Hasn’t it all been said? Haven’t we been given the dozens of tools and all the methodologies, all the approaches, all the attunements?” I mean, there’s just a part of me that feels like all those words have been said, and all we need to do is just take the energy, allow it to be inside of us and blossom… and we’re there! SM: … and to share our experiences with others. And that brings me to when you are talking about the Tsunami of Love and the heart opening and everything. I had a vision, probably last week sometime although, gosh, time is so strange… I have no idea when it was… recently I’ll just say. At this point, the focus of the energy is now about opening the pineal gland of everyone on Earth, because we’ve all had electromagnetic and chemical things done to us that limit our ability to open to and perceive our spirit messages. But that time is coming to an end, if not already ended, that it’s about the pineal opening and being available to these things. And you know what, once again, it’s like to let go of the ‘How?’ and just trust that it’s happening. SM: … when you let it go. Linda: … when you let it go. And our pineal has been activated and activated, and this is part of the gifts that have been given to us. But it is that belief system that is still the whispers, the echoes, the concrete wall that’s still in the way of truly believing and, therefore, allowing that connection to really come to the fullness because we are restoring. I mean, the Mother’s saying, “We are being reborn; I’m in you, you are in me.” She couldn’t possibly be in us and we have completely closed down systems. It wouldn’t work. SM: Well, there’s also been all this talk lately of those who are working at a regular job, nine to five, and don’t necessarily have the ability or the desire, the capacity, whatever, to do a lot of spiritual work. I really do feel that there are enough of us holding this space for others that can’t do that to bring us all along. I’m not sure if an awareness of what’s being done for humanity by so many other humans, galactics, all that sort of thing… I guess it would be helpful for people to know that, but there are so many that are clueless, clueless about all the work that’s being done on their behalf, and they just continue through their lives and probably complain about their lives. Those are the pineal glands that we want to be opening and I guess we have to trust that it’s happening and it’s a process and people are where they need to be. Linda: It’s a process, yes. What I’m feeling right now is that I would like to give a shout-out. I would like to give bouquets and lace to all the people that are getting up at 5 and 6 am every morning and trudging off to work, whether it’s in an office or a factory, or a school or a government building. And so often, because I do the individual readings, I hear that complaint. So, if we could talk about it just for a sec… So many people feel, and it is a feeling, that they aren’t doing the “spiritual work” because they’re trying to make ends meet, they’re trying to support their family and keep a roof over their head. The point is, yes, there’s those of us who are working flat-out, i.e. you and I, doing the spiritual work and sharing what we know and our insights, but don’t for a second, not for a millisecond, don’t think because you’re “stuck” – because that’s a belief – stuck in going to work every day that you’re not doing your spiritual work. Because if you’re carrying the Love and the Light in your heart, then you really are on the front line of this lightworker, love-holder, Ascension work. You are on the front line, you are in the trenches and you are doing the work, because every time you walk into that office or that factory or that store or that school, you are bringing that awareness, your expanded field filled with Light, and you’re bringing it and you’re anchoring it, and you’re being a transmitter and you’re working with the populous. So give yourself huge, huge credit. And you say, “Yeah, but I don’t have time to meditate. I don’t have time to do the listening, the channeling, all that work.” But if you just… as you jump in your car or as you jump on the bus or into your carpool, if you just open your crown, fill up your heart, fill up your body, feel that expansion, and that takes like 20 seconds. And then just hold that all day, and everybody around you is going to get it. Linda: So that’s how we are going to reach all those people that we think aren’t awake. SM: And we do need to focus not on what we haven’t been able to do but on what we have been able to do, because it’s a lot. Anyone in their life, and the people that do the 9 to 5, you show up; you show up every day and it’s just an amazing and beautiful thing. Linda: It is. And you know, we teach, the Council teaches 13th Octave LaHoChi which is a healing modality, but people worry about, “Oh, am I going to be able to run the energy, am I going to be able to feel the Masters?” But the slogan for La Ho Chi is “Show up!” I mean, it’s that simple. When we show up and we show up with our hearts and our fields, we are doing the work. So don’t get discouraged if you think you’re stuck in that 9 to 5. You are doing brilliantly. SM: Exactly. We all have a role to play. SM: That’s true. We’ve gone on for quite a while. I guess we can welcome our guest in then. Linda: Well, let’s do a little meditation. Serapis Bey: Greetings, I am Serapis Bey. SB: And welcome to you. And I also continue this theme of rebirth and regeneration, of re-emergence, of resurrection, of Ascension, of regeneration. It is the time of the Mother’s New Time, and that is why I stand before and with each and every one of you this day. And yes, I welcome you into my Temple of Luxor; I welcome you into the Temple of Ascension, my friends. But more importantly, I welcome you into my home, into my domain, where now you will be comfortable – yes, 11th dimension, hovering over the sands of Egypt, a place where I have welcomed you many times before. Repeatedly we say to thee, to all of you, that the old third dimension is gone, it is history, it no longer exists. And yet, you are persistent in continuing in your attachment to the ethers and in the attachment to what no longer serves you – it never did. Now, I have been known… oh, for eons… as a spiritual teacher, and yes, a teacher of discipline, of spiritual discipline. I come to speak to you and to your hearts of this matter of discipline, to wield you, to pry you, to pull you, to assist you, to coax you away from this antiquated belief of living somewhere that no longer exists. And you say to me, “Well, Serapis, you’re a fine one to talk. How do we even know the Temple of Luxor exists?” And that is why I am inviting you directly into my home, into this domain where you may learn and thrive… and yes, dearest Suzanne, ignite your pineal gland far beyond what any of you have imagined. But first, the starting point is letting go of the illusion. Now we know that this is a very concrete illusion, one that has been downloaded into your physical, your spiritual, your emotional, your mental DNA, your constructs of what you believe to be true. You have many films – you’ve been very good at making films – that show you and demonstrate that this belief system is not… not only is it not worthy of the brilliance of who you are, it does not have form and substance. This is the curious nature of what you have thought of as the ‘old third’. You have thought of it primarily as the dimension of physicality, and there is no desire, above or below, to eliminate the dimension, the clarified dimension of physicality. It is a gift, it is a precious gift, and it is an experience that the Mother created so that you would have the joy of being in form. What you think of as the ‘old third’, yes, it demonstrated, it attached to the third dimension of physicality, but it could have attached anywhere. But it took ground in physicality. But the qualities, the distractions, the anathema, the power of the ‘old third’ was not physical – it was ideation. It was paradigms of belief that you are not worthy, that you are not potent, that you are not powerful, that you are not capable, that you are not Creators, that you are isolated and separated, and all of it. Everything you can think of that ‘old third’ is a belief system. So I come as friend, as ally, as Master, as teacher to assist you, through the strictest discipline, for you to sever your connections with that that do not serve you. If your ideation and belief system was one that you are magnificent, that you are truly powerful in so far as carrying the light of God, that you were worthy, that you were Creator, that you were beautiful and sublime and unique, then I would say, “Cling to it; cling to it the way I would cling to the alpha and the omega.” But it does not. Now I know that I speak to you as lightworkers and love-holders, but we have also… and I have prodded the channel to speak of all of you who are stuck in what dear Suzanne has called ‘the nine to five grind’ because that alone, that work that you do if you carry the truth of who you really are into that arena, into every arena, the changes that you are seeking, the anchoring of Nova Earth, of Terra Gaia, happens in the blink of an eye. Not three or four or eight or ten or a hundred years from now, but in the blink of an eye. When you acknowledge, accept and anchor, remember, claim, re-claim that you are mighty… You are not this small being stuck inside a human body. You are angelic, you are starseed, you are Masters, not masters in the making. You are Masters. We have stopped using that term ‘masters in the making’ years ago. You have claimed your mastery, you have claimed your Creator self, you have been fully infused with the Mother’s energy, cleansing, and yes, the seeds of rebirth. And the rebirth is not for ten years hence – it is for right now. And in that time of ‘immediate’, I step forth. Now why? Why do I wish to speak to you of spiritual discipline? I do not wish to completely eliminate your ego, although I certainly wish to assist you in eliminating that part of your ego that is clinging to illusion, clinging to drama, clinging to lack, clinging to the belief system that you are less-than. I do not invite ‘less-than’ into my home. Now, let us speak of what I am asking of you this day and every day. What is discipline? It is consistency. It is the assumption of responsibility. Yes, responsibility to your sacred self, to your circle, to your collective, above and below, and to the Mother. It is you fully assuming that responsibility, that element of leadership however it looks, and declaring that you will do, you will be, you will act, you will experience, you will embody wholeness, Love, Divinity, and nothing else. Now that is where the discipline comes in. Nothing else. So you are declaring, with me, as your master, as your teacher, that you will not allow yourself to be distracted by untruth, by what feels familiar and is lies, lies within and lies without. If you have not cleared your core issues, beloved one, it is time! Because these illusions you have about yourself are absurd, and there is no room for them in the truth of your interdimensional self. I am not even asking you – although it is highly recommended – to anchor firmly in the 7th. But you are interdimensional beings. That is why I mention that my home is in the 11th and I have thrown open the Temple doors to welcome you. Discipline is not merely about assuming a mantle of responsibility, which to many of you says, “Oh, I have too many responsibilities right now; I can’t possibly take on anything more.” Most of those beliefs of responsibilities are illusions. Your only responsibility is to be the vehicle of Love and the Servant of the Mother, period. How you do that is unique to you. But that is your sole responsibility: To be Love. So I will bring you back gently, firmly, consistently back to this place of balance. Because when you are in the centre of your beingness, the centre of what this and so many have called the fulcrum, the teeter-totter, the seesaw, then you are attending to all aspects of your sacred self. You are not in the drama and you are anchored firmly on Terra Gaia, firmly in your home of your heart, firmly in the Temple with me, and you are not running hither and yon, trying to discover. You are simply balanced in the stillness, the truth, the beauty, the wonder, the awe, and the Creator-self of who you are. You cannot create if you are running back and forth in extremes. That is not discipline. That is the way an unsupervised and unloved child – the children know! Yes, they will run around like crazy, and when they are tired they will simply plop down and go to sleep. And when they awaken, they are rebalanced. That is what I am asking of you. Is this clear, dear Suzanne? SM: Yes, it is. Thank you very much for joining us on this day. It’s been a very interesting conversation and I have to say that I do feel my mastery and Creator-self coming online more every day, and it is very exciting to me. I am also wondering if physicality was supposed to be so challenging – this aging thing, and having to be vigilant and caring for our bodies feels like such an unnecessary distraction. I imagine you’ll be telling us that the beliefs around our bodies are part of the illusion, and I get that. But what isn’t so clear is what is to be done to shift us away from what happens with our aging physicality. I visited my Aunt yesterday in a nursing home and it just seems so unfair for these elders, because of their physical needs, that they have to be in an assisted living situation that if any kind of emergency happens, they need to have assistance right there. They lose everything: they lose their homes, their positions, they have nothing anymore, and like anything they identified with who they were or what they worked so hard all their lives to have around them, and all of a sudden it’s nothing. It just seems so wrong. SB: It is exceptionally wrong. It is tragic, it is grievous, it is a travesty. Let me be clear, for I am quite outspoken on several matters. The body… you came as angelics to be in-out, in-out, in-out, in-out of body as you chose. You were never intended to be stuck and aging. What is the joy, the beauty, the Love in that? And so the tragedy – and this is where the old third built structure, but it was built on these false belief systems. And why would one want to cling to an old reality that strips people of everything they have ever had, including their dignity? So what I am inviting you to do… Yes, we do not remedy those who are in your Aunt’s situation; we will lift them up and bring them home and they will be so relieved. But, having said that, part of your Ascension process, why I encourage you to come and be multi-locational through the various dimensions, that very action, discipline, practice, assumption of responsibility, begins to dissipate the aging process. You cannot be in the 11th dimension and be an old woman. It won’t happen. SM: Well, that’s very interesting because yesterday I had this amazing and wonderful vision. I was seeing the Earth from space and the Earth got smaller and smaller, as if I was leaving. I started having anxiety to say, “No, I have work to do here and I want to be part of this, and it’s such a beautiful thing and I am so connected here.” And then the answer that I got was that I can do both. I can be out in the Universe and doing my things, and also be anchored here on Earth and doing my work here. And so that brings me to this other, very far-out kind of question. Does each Master have a fluctuating number of expressions throughout the Universe? Like clearly we can… I feel like I am playing with bi-location doing this. Is this Ascension in part about having knowledge and awareness of all of them at once? SB: You are integrating all parts of yourself. Of course we work throughout the multiverse. We are not simply stationed or attached to Earth by a tether, or to this reality by a tether. We explore, as you will explore, the multiverse and still be in many places at once. Now, part of the preparation to be able to do that, and part of the discipline, is also anchoring all of who you are, because you cannot begin to bi-locate from a place of fragmentation. So what you do is you anchor the totality of your divinity, of your physicality, of all aspects of yourself, so that everyone is home. And then you can assign them. Now, they go on furlough and you call them back for R&R, but you are the master of that retinue, of your crew shall we say, of aspects that you send back and forth. So yes, you are playing with bi-location. It is part of your interdimensional self and you are learning this. SM: That is so wild to me to think that this physicality, this body, this vessel that I am in right now, would be the one to anchor all my aspects. But what is it about this one that makes it the one that gathers everyone together? SB: This is the part of you that is in mastery, and you tend to think of it… and this is why we say, “let us put ego in its proper place”. So you tend to think of ‘me’ as Suzanne Maresca in this body, this small form. “Why do I get to be in charge?” But it is the truth of your full being that is the mastery, and the delight of having that mastery expressed and live and be in and out of form in this beautiful body that you have designed. SM: Right. I have been feeling less and less subject to the energy of other people and situations. I don’t want to say ‘above it’ but sort of untouchable, if that makes sense. SB: Yes, and that is the discipline. You always have a choice. Do I engage or do I not engage? Well, the true outcome of the balance and the responsibility, and the gift of discipline is the consistent choice not to engage. SM: Right, but at the same time, accepting the Mother’s assignments as it were. It feels right in my body to take in certain things. And while I’m saying to myself, “OMG, I’ve got enough on my plate and I can’t do any more,” something is presented in my situation where I end up being Power of Attorney for someone. I don’t even know what I’m stepping into, but it just feels like the right thing to do; and it feels like in service to the Mother and I’m just going to do it. SB: The Mother never gives you an assignment, etheric, spiritual or physical, that you are not capable of assuming. So it is not assuming the drama of this undertaking, of the family, of the various situations. It is simply being the vehicle, almost of neutrality, of balance, of saying, “I will be responsible. I will take the leadership position, but I will not get engaged in the drama.” Yes. That is the discipline. That is the balance. SB: That is it exactly. It is the choice, not the abuse of power and control which is what discipline in your realm, in the old third, came to mean. It is discipline in terms of a course of study. What discipline do you study? What discipline do you follow? Are you a vegetarian, a vegan, a carnivore? Are you a yogi? Do you study tai chi? These are disciplines. SM: Right. And a discipline can be of your own making. I’m not feeling guided to follow any particular human at all, and it just feels like what I’m doing is completely designed by me? SB: It is your discipline. But what you do in designing your own discipline is you also make a soul-heart-spirit promise to adhere to your discipline. It is about adherence, dear heart. SM: Okay, stick to it. I did ask before and the answer was… I’m just going to ask again. Does each Master have a fluctuating number of expressions throughout the Universe? SB: We have a number of ways in which we are known, yes. But does the essence change? Does our mission and purpose change? Does what we do change? No. We are very consistent. SM: Okay. So I just have this strange question. I’m not really sure how to formulate it. In terms of the souls in existence, if we are all continually recycled and reincarnated, and we each have many aspects throughout Creation, how many of us are there actually [laughter] in existence? I know that’s a very strange question, but I’m just trying to wrap my mind around how woven together we all are. SB: You are very interwoven, as are we all. But understand, you are also existing in an infinite Universe so the number is beyond measure. SM: Alright. I guess I’m not really going to get a handle on this. [Laughter] In terms of the population of Earth of 7 billion, how many of us are like… I don’t want to say ‘duplicates’ because it’s not a duplicate, but do you understand what I’m getting at? SB: Yes, and we are not prepared to tell you that yet. SM: Okay, I get it. [Laughter] So, ancient Egypt, can we talk about that a little bit? SM: Alright. Did the ancient Egyptians foresee our current civilisation and these chaotic times on Earth? SM: Okay. Are we in the space that they thought we would be, or is it off course? SB: Now understand, the gift in many of the temples, including mine, in ancient Egypt was not to write the script. It was simply an understanding of how things could unfold and there were many scenarios that were envisioned. So are you on track in terms of that visioning process? Yes, you are. We did not think that it would take so long to eliminate what we would refer as ‘the darkness’. We did not anticipate such resistance to surrendering the darkness and the drama because it had served no purpose. It is a curious thing to attach to. SM: Right. Are we close? SB: You are very close. That is why I am coming as your teacher to say, “Now, be disciplined with yourself. Watch and make sure you are making choices that are in alignment with the truth of who you are, with the balance and with the Love. There is no other realistic choice. SM: Okay. Mystery Schools – was there more than one, or was there just one ancient Mystery School? SB: Oh no, there are many ancient Mystery Schools. SM: And it was about teaching the truth of humanity and why we’re here or so much more? SB: It is so much more. Think of it in many ways. We have talked about this word ‘disciplines’ in terms of physical-spiritual practices. But there were those that were interested in the alchemy of healing. That was an entire Mystery School overseen by St. Germaine. There were those who were simply interested in the alchemy of Creation, of bringing forth out of thin air objects and experiences. Their truths are given and they are based always on the Universal Laws. But the variety in which one would choose, where some could be quite social, boisterous, involved; others were very secret. ‘Mystery School’ did not necessarily mean ‘secret’. It simply meant understanding the mysteries of Creation, the mystery of the Mother/Father/One. SM: Beautiful. Well, I’m kind of out of questions but I imagine that you have more to say, so if you have anything else in closing, that would be most appreciated? Long ago, the Mother and Archangel Gabrielle have suggested to you that if it does not feel like Love, if it does not feel like Joy, why on Earth are you doing it? Why on Earth, or any planet, would you choose to proceed? So now I ask you, in ways that are small and great, if there is an aspect of your life… and I do not mean the momentary thrill, because discipline tells you that the momentary thrill is simply that. But are there aspects of your life that are not in keeping and alignment in the discipline of who you really are? How do you know yourself? You cannot be in balance, in discipline, in responsibility, in alignment, if you do not know the entirety… yes, you say you get glimpses, but you know the truth of your heart. If you are not in alignment with the truth of your being, then you cannot take the next step into discipline. So I leave you with that thought. Are you aligning every day with the truth of who you are? And do not say to me, “Serapis, I have to get up and go to work every day and it is drudgery; I have to pay the bills.” So what I would say to thee is the truth of who you are: that you are a caretaker, that you are a nurturer, that you wish to take care of your family – not that you have to, but that you choose to because you love them, because you love being a provider, a supporter, a nurturer. Does this give you Joy to see the light in your children’s eye, to see the welcome smile on your colleague’s face? Does this give you Joy? Is it in alignment with the very Truth? And in that Truth, are you choosing to create something different? You cannot create something new and different if you have not come to the full understanding of who you are. That is your starting point. And from there, quite literally, the sky over Luxor is the limit! SM: [Laughter] Thank you so much. Thank you. SB: Go with my Love and call on me. I am prepared to walk with you, to assist you. Come to my home and I will welcome you with open arms.